At your arrival at Girona airport, please exit the airport terminal, walk across the crosswalk, turn to your left and continue along the pavement bordering the main car park building towards the main roundabout placed at the airport entrance. You will see our premises just a few meters on the other side of the roundabout. In total less than 350 meters. 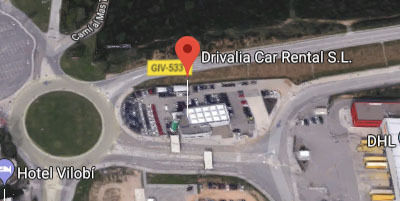 Download here Drivalia Girona airport car hire return instructions.